Sprinkle the flour on the work surface. Unfold the pastry sheet on the work surface. Roll the pastry sheet into a 14-inch square. Spread the preserves on the pastry in a circle about 1/2-inch larger than the cheese. Sprinkle with the cranberries and almonds. Place the cheese in the center of the pastry. 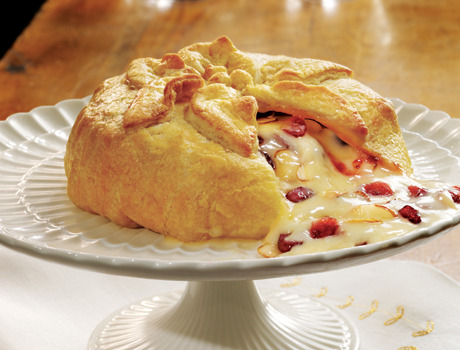 Fold the pastry up over the cheese to cover. Trim the excess pastry and press to seal. Brush the seam with the egg mixture. Place seam-side down onto a baking sheet. Decorate with the pastry scraps, if desired. Brush with the egg mixture. 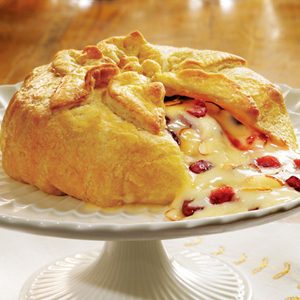 Flavor Variation: For Brie en Croute Provençal, omit the preserves, cranberries and almonds. Stir 1/4 cup diced jarred sun-dried tomatoes, 2 tablespoons olive tapenade and 2 tablespoons toasted pine nuts in a small bowl. Spoon the mixture in the center of the pastry sheet. Top with the cheese and proceed as directed above.